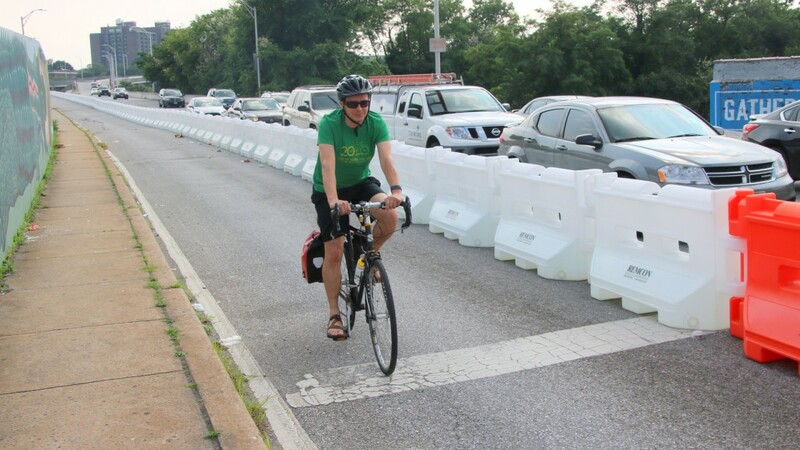 On Tuesday, in the blasting heat, Victor Miranda pedaled home from work using a new two-way temporary protected “shared route path” designed for cyclists as well as runners, walkers, wheelchair users and other pedestrians. Miranda explained how the broad stretch of roadway above the Jones Falls Expressway has long been unpleasant and unsafe for anyone other than drivers. Pedestrians and cyclists have until now been relegated to a gritty, narrow sidewalk next to fast-moving traffic. Just before the bridge, they were forced to use an ancient footbridge with steps in order to safely cross over a heavily-used entrance to the JFX. So is Miranda loving the new “pop-up” lane, installed over the last few weeks? Not so much when he’s driving his car. “It’s created really bad congestion,” he observed, noting that drivers on both ends of the route are feeling it. So, all in all, what does Miranda, a longtime bike rider, think about the Big Jump? Bike lanes have been a flashpoint in Baltimore in recent years, with controversy erupting in two of the city’s more affluent neighborhoods. The Roland Park cycle track prompted contentious meetings and nearly three years of continuing debate. Another bike lane in Canton, on Potomac Street, has spawned litigation and charges from bike advocates that Fire Department employees intimidated and attacked them, physically and online. With the Big Jump, “complete streets” supporters are hoping to have a good showcase for their argument that improving infrastructure for bikers and pedestrians makes for a safer, saner and – when so many residents lack access to private vehicles – more equitable city. The pilot project is intended to connect Remington and Reservoir Hill, separated for decades by an expressway that has also served as a racial dividing line. “I feel really good about the Big Jump. I love talking about it,” said Liz Cornish, executive director of the advocacy group Bikemore, describing benefits she said are vast. With 29th Street narrowed from three lanes to two at Sisson Street, for instance, cars zooming west to reach the JFX are forced to slow down, which allows bikers and pedestrians to safely get across. All along the route, cyclists, children, parents with strollers, seniors, people who use wheelchairs – the city’s most vulnerable residents – will have safer streets while the project is in place, she said. “People who because of traffic can’t go four blocks to get to the Farmer’s Market and have to get in their cars and drive there – that’s the real injustice,” Cornish said, noting that nearby neighborhoods have been involved in years of planning ahead of the project. 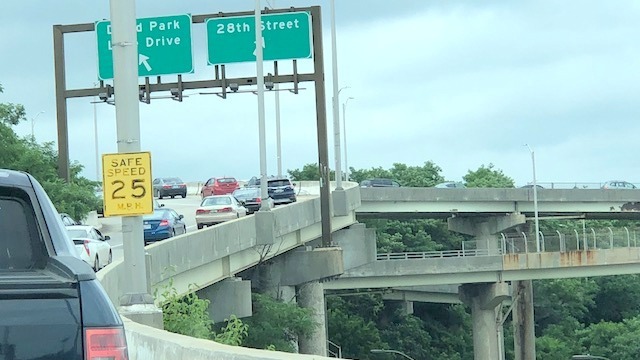 Driving on a weekday at about 3 p.m., Cornish said, she experienced the slow and stopped traffic on the 28th Street bridge, but said it was no worse than other back-ups on I-83 ramps. 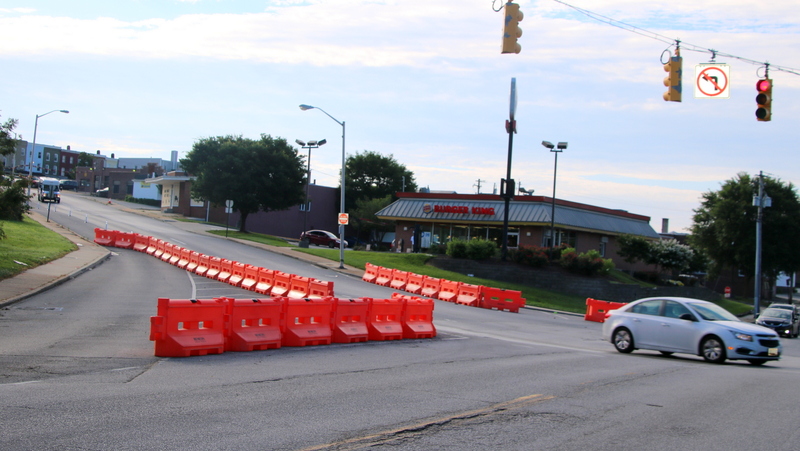 Officials at the Department of Transportation confirm that the city is planning some changes, including one meant to address perhaps the worst current bottleneck, the intersection of 29th and Sisson streets. Reduced to one lane, northbound traffic has stacked up, creating a late afternoon back-up that can extend the entire length of the 28th Street ramp off I-83. At that spot “a left-turn signal phase is being installed to try and ease the congestion,” DOT spokesman German Vigil said. The project has been chiefly funded by a $750,000 grant from People for Bikes. To Graham Coreil-Allen, a public artist and Auchentoroly Terrace resident, all the focus on the Big Jump’s auto traffic impact is misplaced, even backwards. 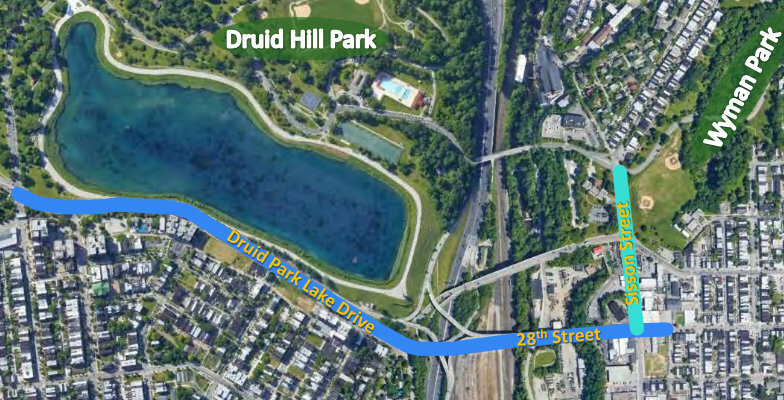 “I would appreciate more patience especially from drivers who have been riding through our neighborhoods for 70 years,” said Coreil-Allen, who has made a study of road construction in 1960s and 1970s that cut the community off from Druid Hill Park. The Big Jump won’t solve all the problems in the area but it’s a big start, said Coreil-Allen, noting that additional signage and other tweaks are planned and that DOT has begun a major corridor study. Councilman Leon F. Pinkett III echoed Coreil-Allen’s theme in a statement released this week. The EPA project involves the blocking off of the recreational loop around the Druid Lake reservoir to install two underground water tanks. The project, intended to help the city meet federal drinking water standards, is scheduled to be completed in 2022. A neighborhood event to celebrate the Big Jump is being planned for next month by city officials and supporters. Among those supporters is Barbara Anderson-Dandy, president of the New Auchentoroly Terrace Association. 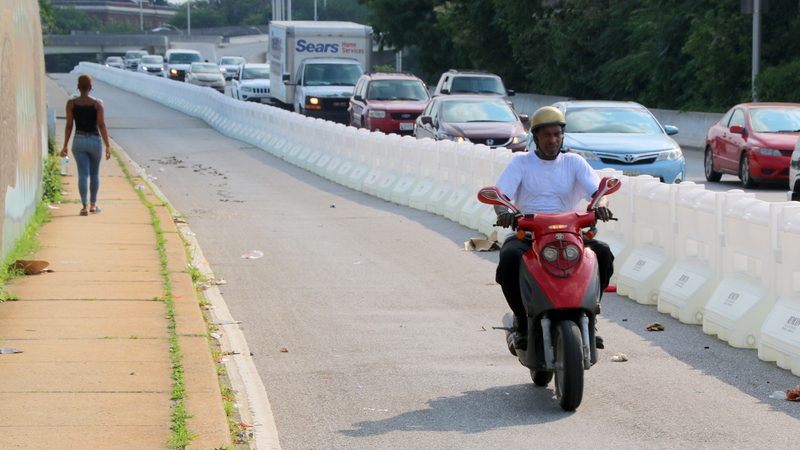 The new lane is causing new back-ups that extend to Gwynns Falls Parkway. Asked how the Big Jump is impacting automobile traffic, Anderson-Dandy didn’t mince words. “It’s a nightmare,” she said, describing back-ups that extend to Gwynns Falls Parkway. But as she sees it, the area was going to be congested anyway because of the reservoir construction. She believes the roadway configuration will be better when the city completes the reservoir work. In the meantime, anything that slows down the cars speeding through her neighborhood is a good thing. “Find an alternate route,” she recommends, explaining that she now drives through the park itself to reach the 41st Street Giant and Mom’s Market. Miranda sees things differently. He worries that the new bike lane may not be worth the traffic congestion it is causing. “I wouldn’t have designed it that way,” he said. Cyclists like him can take alternate routes (he prefers Anderson-Dandy’s approach, going through the park). But others taking the direct route across the bridge, even with the new lane, are still next to whizzing traffic. Cars, meanwhile, have few other east-west options besides 28th and 29th streets, he said. So why was Miranda out on the bike lane in the hot sun? He said he understands the good intentions of the Big Jump’s creators and is rooting for them.